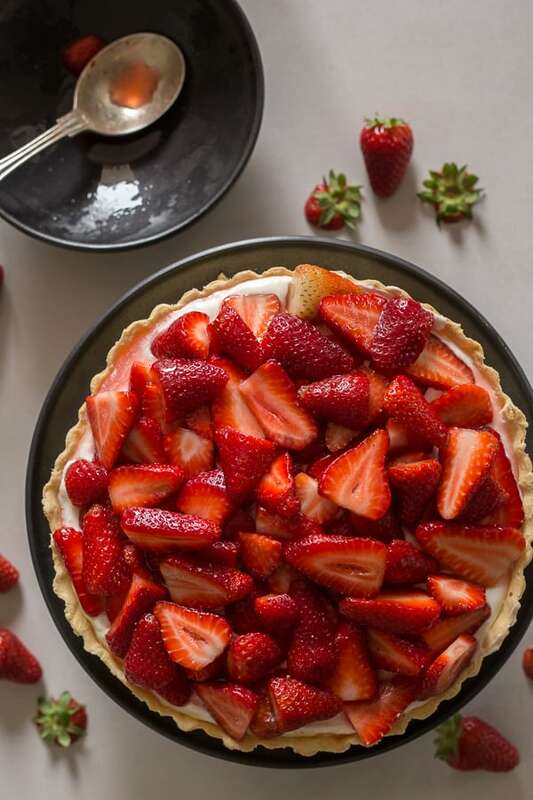 Fresh Strawberry Pie is so delicious, made with a creamy Mascarpone filling and a delicious not too sweet Fresh Strawberry Topping. 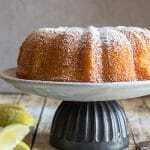 The perfect Dessert Recipe for any occasion. So yes Strawberry season is in full swing here in Italy. And my youngest daughter couldn’t be happier! I love pastry crusts so I really didn’t have any desire to make a cookie crust for this no bake filling. And I also decided not to add any gelatine to firm up the filling, nothing a little freezer time can’t fix! So therefore the filling is creamy! And aren’t they the best fillings? Make the pie crust or buy a store bought crust, make sure to roll the dough on the thinner side, and blind bake it. Make the mascarpone filling, then place it in a glass bowl, cover the bowl with plastic wrap and refrigerate it for at least 4 hours or even overnight. 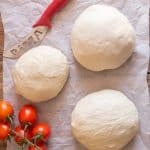 A half an hour before serving, fill the baked crust with the Mascarpone Filling and place it in the freezer for about 15-20 minutes. 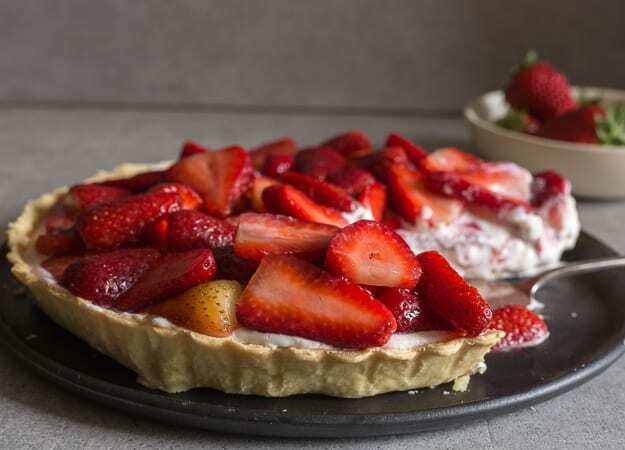 While the pie is in the freezer, Slice the strawberries and tossed them with a little sugar. 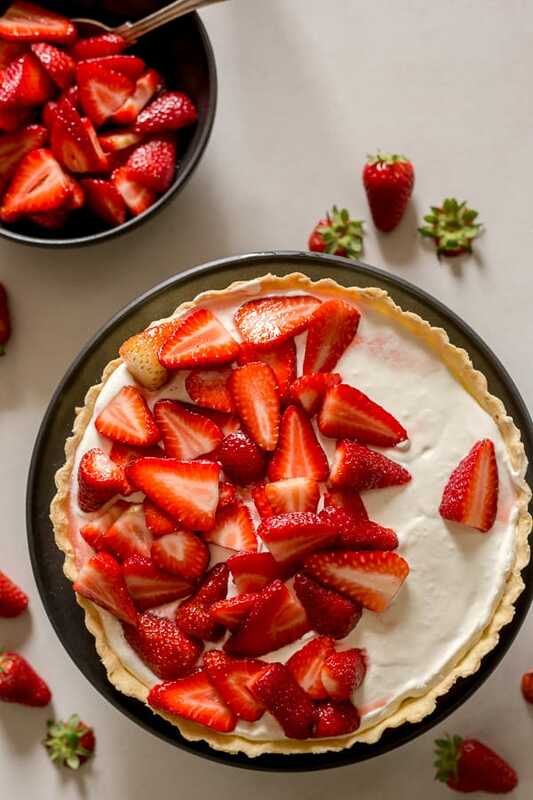 Remove the Strawberry Pie from the freezer, top with the strawberries and serve. So good! 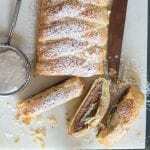 What are the best Pie Doughs to use for a cream filling? Italian Crostata Dough – I love the taste of an Italian pie crust, the eggs give it a delicious flavour and flakiness. 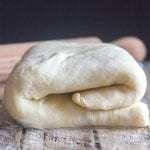 Easy Homemade Pie Dough – This was my Mom’s Pie Crust recipe and it is one of the best. Homemade Brown Sugar Pie Crust – The addition of a little brown sugar gives this dough the perfect sweetness and a delicious flavour. 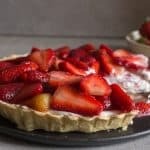 Easy Nutella Pie Dough – This is the perfect crust for any and all Nutella Lovers, and it would be amazing as a crust in this Fresh Strawberry Pie. These are all double pie crust recipes but the extra dough can be frozen for future use. In a large bowl add the cream (whole or whipping cream), mascarpone, a little powdered sugar and vanilla. Beat on medium low speed until the ingredients are combined. Then raise the speed to high and beat until very thick. Refrigerate for at least 4 hours or even over night. One of the best reason to look forward to Spring and Summer are all the wonderful fresh fruits and berries. I hope you enjoy this Fresh Strawberry Pie with a Mascarpone Filling. More Fresh Berry Recipes you may enjoy! Start by making your pie dough anyone of these would be perfect. Or you can use a store bought. Be sure to roll the dough to 1/8" thickness and fit in a 9 inch pie plate that has been greased and floured. Prick the bottom of the dough with a fork, then cover the dough with parchment paper and weigh it down with dry beans or pie weights. Bake for approximately 15 minutes, remove paper and bake for another 5-10 minutes. Let cool completely. In a large bowl add the cold cream, mascarpone, powdered sugar and vanilla and beat on low speed until combined, then raise the speed to high and beat until very thick. Refrigerate for at least 4 hours or even overnight. A half an hour before serving the dessert, add the mascarpone filling to the baked pie crust. 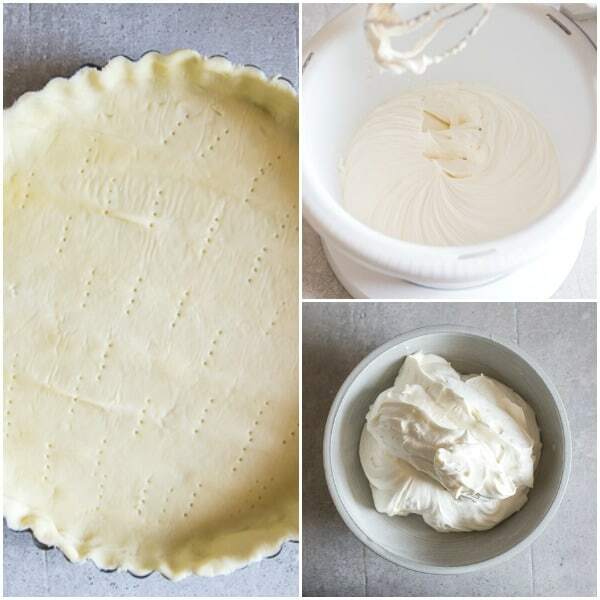 Place the pie in the freezer for 15 - 20 minutes, you do not want the filling to freeze, just to stay firm. While the pie is in the freezer make the topping. In a medium bowl mix gently together the sliced strawberries and sugar. 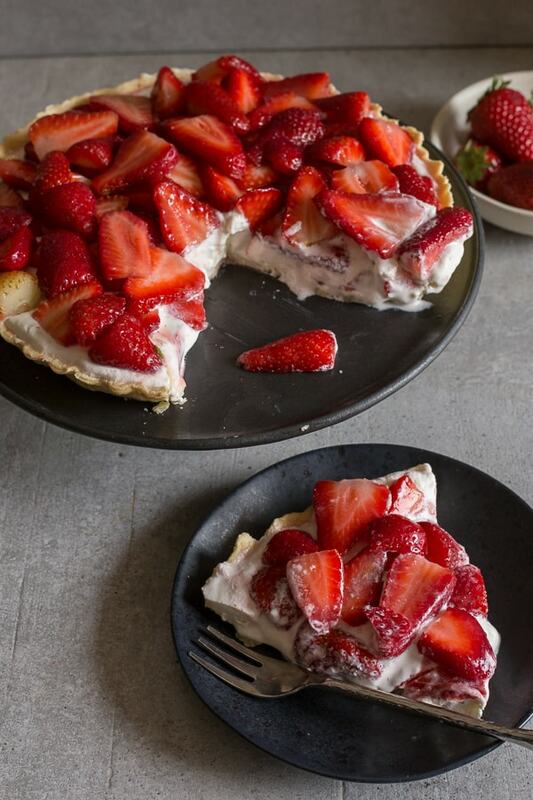 Remove the pie from the freezer and top with strawberries. Serve immediately. Enjoy! Hi Susie, I would actually make everything in advance, (refrigerate the filling, leave it in a bowl covered with plastic) and pre bake the crust, then put it all together before serving. (remember to freeze it for about 15 minutes if you want to firm it up). Hope that helps. Rosemary this sounds amazing! I love the no gelatin creaminess! So gorgeous! Hi Karen, thanks so much, hope you enjoy it. All I can say is WOW! Gorgeous as always, and it got rave reviews from my friends, thanks so so much!! Hi Dana, thanks so much so glad everyone enjoyed it. Have a great Sunday. THANK YOU for explaining so clearly how to make the mascarpone filling! This was so helpful and I can’t wait to dig in to this scrumptious pie! Hi Samantha, thanks, I hope you enjoy it. Have a wonderful Sunday.